There's no better way to add color to your gardens than with annuals. and the Winter's are FREEZING. and we've been planting for weeks. That's a lot of time on my knees. love the way they trail down the pots! they seem to enjoy our HOT Summer days. in the cool of the morning. by giving us an endless supply of blooms. they do best in my gardens in part shade. 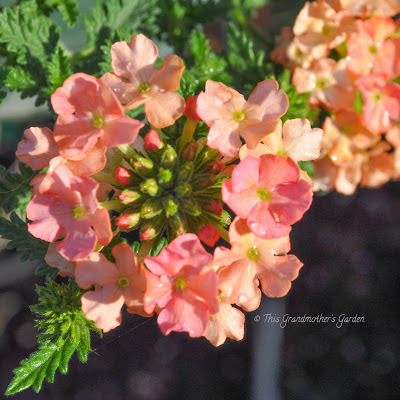 They thrive in the heat and are drought tolerant once established. they are just plain cute, don't you think? there is always a coleus to match. 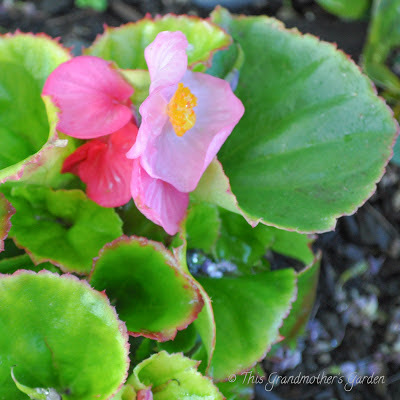 I plant these as companions to the begonias in my garden. they detract from the glory of the leaves. 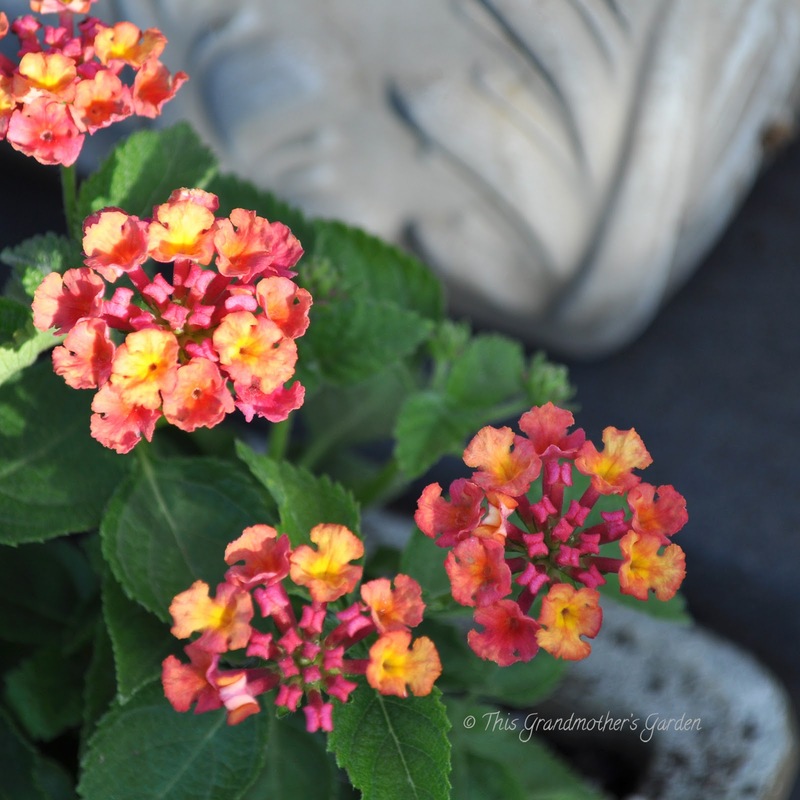 I've fallen in love with Lantana. Their bright colors and sweet scent have captured my heart. I've planted several varieties this year. One can never have too many, you know. That's a taste of what we're up to. Are you noticing a color theme here? Next post we'll highlight the BLUES. 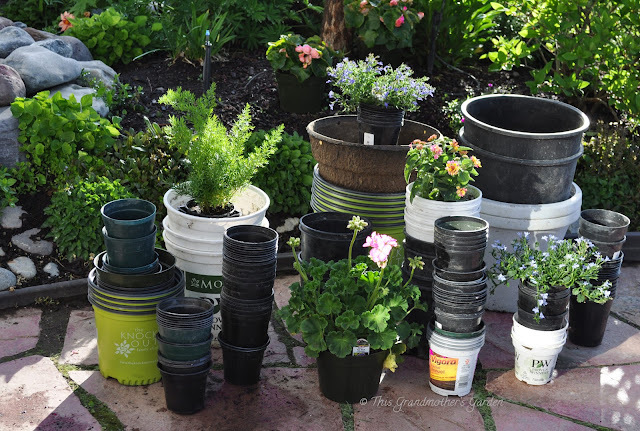 Holy cow, that's a LOT of pots! And those blooms are spectacular! 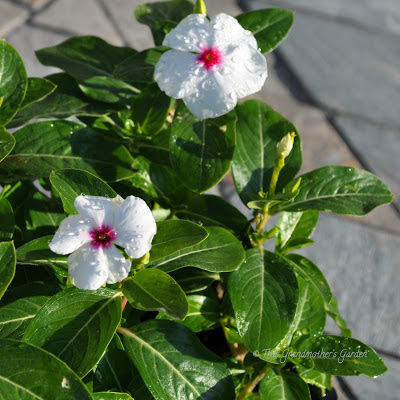 I agree with you on vincas. 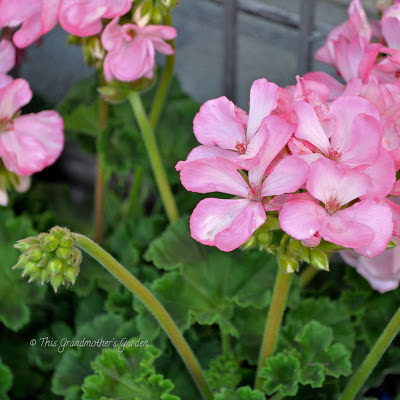 They are cute as a button, and are great additions to anybody's flower beds. Yes! Another Vinca fan! I must admit, I only like the polka dot variety... something about the white with the bright pink eye. Very pretty! I love all the peachy colored flowers. Happy gardening! I do, too! Thanks for stopping by! Can't wait to see it! Looking beautiful! And I can hardly wait to see you! Your annual choices are great. 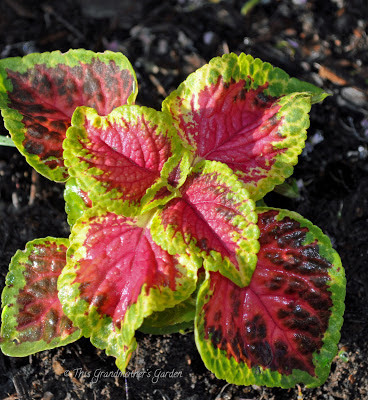 Lovely blooms and of course Coleus is always a beauty in the gardens. For those with such short blooming times it sure adds the color that takes so long to achieve otherwise. Thank you, Cher... I'm guessing Ohio is also Zone 5? Love the colors and I have not started...on my way to the nursery this cold weekend...loving the more coral hues this year. I'm seeing a lot of coral this year... in plants and apparel. Wishing you sunshine dear friend. I would love to see it in person .. the whole area you live in is such a beautiful place .. you are very lucky !! Thank you, Joy. We feel very blessed to live here. We don't usually plant so many annuals. With the late Spring, we weren't sure what might be blooming in the gardens so planting annuals was our assurance that there would be color. Carolyn, these geraniums are wonderful! I plant them too, in pots and in boxes. 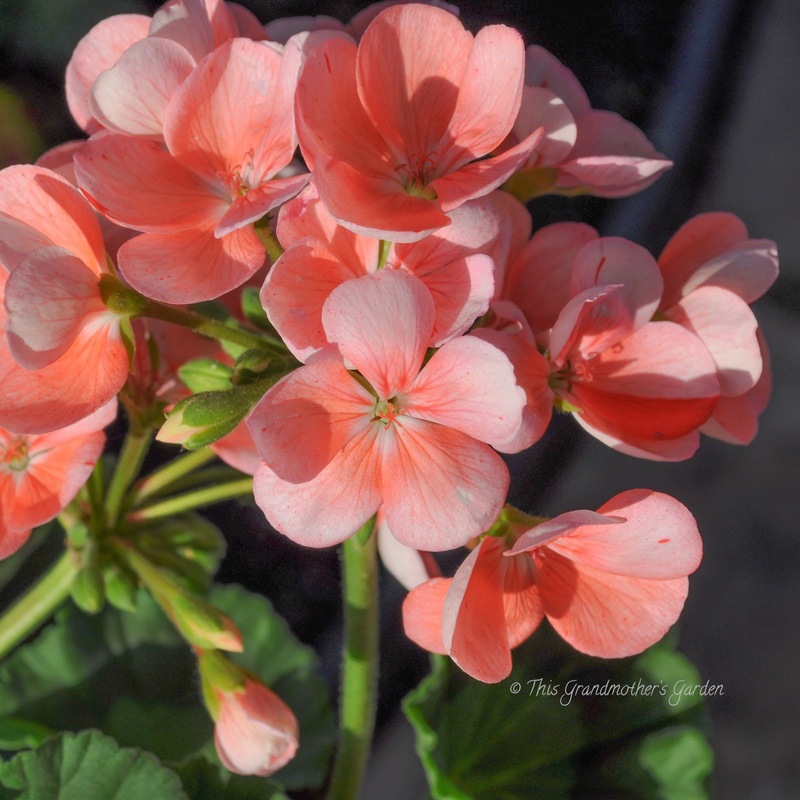 The first time they are cold, some leaves get red, but by June geraniums bloom very well. Where do you store them in winter? Sometimes I pot a few and bring them in for the Winter. 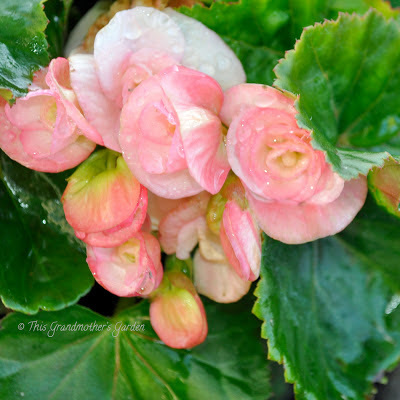 I place them in a sunny window and their blooms cheer us through the dark and cold days of Winter. I'll be interested to see how you mix your annuals into your existing plantings - I've had a hard time making annuals look a part of my perennial/shrub beds. I probably haven't tried hard enough :-) Pretty, pretty flowers, though! We're in the middle of planting just over 2,000 annual plants at the Spokane Temple. Many are not yet in bloom so we have to look with eyes of faith at the beauty that will be there in a few weeks. Since I pinched most of the blooms as I planted to assure the plant would get a healthy start, I am also looking through the eyes of faith that it will all come together. I'll do a post on the long shots once we get closer to "the date". You have lots of pretties at your house this year. I've heard some gardeners make disparaging remarks about annuals, but I'm with you. They give that little bit of pizzaz to the garden, so more power to them! Because of our below freezing Winters, we also include a few annuals in our gardens. Even with plenty of perennials to bloom, I can't imagine going without the bright colors and sweet blooms the annuals bring to our landscape. 213 pots! I am impressed, and your garden should be gorgeous! I do like to sit potted annuals about my garden in the heat of summer, when little else will bloom here. That's what we're hoping for... and working towards. I never mentioned how much time we've spent out there... gardening has certainly been a full time passion the last couple of months. Moi aussi les géraniums font parties de mon jardin, mais pour les pots je n'ai pas un grand succès.